Not only the gateway to the Costa Del Sol, Malaga is an enchanting city in it's own right, bursting with culture and history. The city offers beaches, hiking, architectural sites, delightful parks, art museums, excellent shopping and fabulous cuisine. Malaga knows how to blend old and new effortlessly, with chic boutiques, gastrobars and cool cafés alongside the traditional taverns in the winding lanes in the heart of the old city. The waterfront is beautifully developed - with a promenade, bars, restaurants and shops and new cultural centres - including fantastic museums... and the Pompidou Centre (the only Pompidou outside Paris). 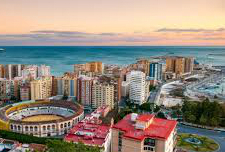 While more laid back than Madrid or Barcelona, Malaga is still the center and transport hub for the hugely popular Costa del Sol region and offers some fabulous historical and cultural attractions, plus a beautiful coastline. Looming over the skyline are the city’s two massive hilltop citadels, the Alcazaba and ruined Gibralfaro, remnants of Moorish rule. The views from the top – sea and city views, including the historic bullring – are intoxicating. Birthplace of famous Spanish artist Pablo Picasso, this city is also proud of its jazz clubs, historic markets, street art, exquisite BBQ'd fish, tejeringos (a special kind of churros, unique to Malaga) and Malaga's own delicious sweet wine. It rarely gets really cold in Malaga, and it is often warm enough to enjoy the outdoor cafe culture in December and January. Although there is plenty to see and do, Malaga is also a place to kick-back and enjoy the laid back Mediterranean style.